I'm pretty superficial when it comes to my cell phones. I like them thin and stylish—drop them in your pocket and forget they're there. They gotta be smart too, I won't settle for any crap interface (although since I'm on Verizon, that's tough to do). So you'd think I'd be all over Samung's new Ultra series, right. Eh, not really. They need more carbs. Much to my surprise, I ended up falling for these two fatties instead. 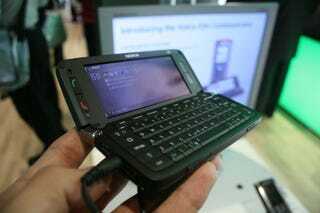 Nokia's E90 and the locked in glass iMate 7150. The E90 is huge. No doubt about it, but the over-sized keyboard feels great. As for the iMate, it's kinda like an E90 with WM6 (size-wise). Take a look and see what I mean.